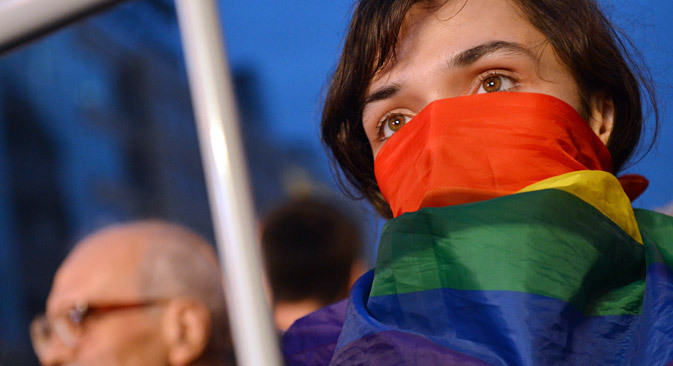 According to the bill proposed by Communist Party deputies Ivan Nikitchuk and Nikolai Arefyev, Russians would be fined or jailed for revealing themselves as gay in public, depending on the location. RBTH presents a selection of views from leading Russian media on international events, featuring reports on a proposal by Communist Party parliamentary deputies to levy fines on homosexual Russians for revealing their orientation, high-level talks in Vienna on the future of Syria, and the continuation of U.S. aid and military support to Ukraine. Communist Party parliamentary deputies Ivan Nikitchuk and Nikolai Arefyev have proposed to introduce administrative responsibility and impose fines or brief prison sentences for public acknowledgment of one's "non-traditional" sexual orientation, the daily broadsheet Izvestiya reports. Under the proposed bill, the public expression of "non-traditional" sexual relations in public places should be punished by a fine of between 4,000 and 5,000 rubles ($65-80 – RBTH). If it happens at cultural institutions or government offices, it should lead to a prison sentence of up to 15 days. "I believe that the problem we have raised is acute and topical, as it addresses the social ills of our society and primarily deals with the moral education of the younger generation," says Nikitchuk. Lawyer Maria Bast said she believes the Communists' initiative is unworthy of real left-wing politicians and the chances of its adoption by the State Duma are zero. "I do not think the parliamentary majority will support it, especially in the light of ongoing fence-mending with the EU," she said. A meeting between Russian Foreign Minister Sergei Lavrov and U.S. Secretary of State John Kerry took place in Vienna on Oct. 23, reports news website Gazeta.ru. It was attended by Saudi Arabia and Turkey, which are strongly opposed to the regime of Syrian President Bashar al-Assad. Experts anticipate that the meeting will be the beginning of a process of peaceful settlement in Syria. "It will prepare new ground for diplomacy and co-operation in the Syrian political settlement. It is important that this is the first meeting to be attended by representatives of Saudi Arabia and Turkey," said Theodore Karasik, an analyst with Gulf Analytics in Dubai. "If Lavrov and Kerry are about 'on the same page,' Ankara and Riyadh are sending 'conflicting signals' about the situation in Syria," he said. Steven Pifer, a leading expert at the Brookings Institution in Washington, believes that a rapprochement between Moscow and Washington will only happen when the Russian military changes its strategy in Syria. "While the coalition forces and the United States are focused on ISIS, Russian strikes are aimed at strengthening the Assad regime, and struck only a small number of ISIS targets," he says. According to his assessment, the Russian strikes hit moderate forces supported by Washington and its allies. If the Kremlin's strategy changes, cooperation between the two countries will be possible. Military and other assistance to Ukraine from the United States will continue, despite Obama's veto on a defense policy bill, reports business daily Kommersant, citing an Oct. 23 statement from the Embassy of Ukraine in the U.S. In the evening of Thursday, Oct. 22, U.S. President Barack Obama vetoed a draft defense budget (National Defense Authorization Act for Fiscal Year 2016). This will allow the head of the Pentagon, in coordination with the Secretary of State, to provide military assistance to Ukraine and "appropriate assistance in the field of security and intelligence services" to the amount of $300 million; $50 million of this sum could be used to provide defensive weapons to Kiev. Overall, the draft budget provided for expenditures of $612 billion. The document was adopted by both houses of Congress, but the president has not signed it due to concerns over a planned growth in military spending of $90 billion. Now the bill will return to Congress, whose members will make an attempt to override the presidential veto. The lower house will hold a vote on Nov. 5. "It should be noted that even in the case of non-entry into force of the Act and other elements of the U.S. budget for 2016, military and other assistance to Ukraine will continue, since in this case, the so-called continuing resolution will be introduced. It will transfer all the volumes of financial costs that are in the 2015 budget to next year," the Embassy of Ukraine reported. Ukrainian diplomats stressed that Washington would not abandon further support for Kiev.